Wellness is coming to your home thanks to the high-quality, high-end materials, careful manufacture and timeless design of Duravit products. Since 1817, Duravit has been creating bathroom products that beautifully bring together aesthetics, practicality and comfort. 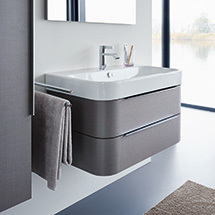 Boasting an extensive product range for guest bathrooms, family bathrooms, even your garden living room, Duravit has all your bathroom needs covered. With a presence in more than 120 countries, Duravit products have widespread appeal across all categories of bathroomware, from washbasins and toilets to steam showers and saunas.